The FORWARD_ONLY Cursor in SQL Server does not support scrolling. This cursor can only move from the first row to last and does not support the other way (scrolling backwards). 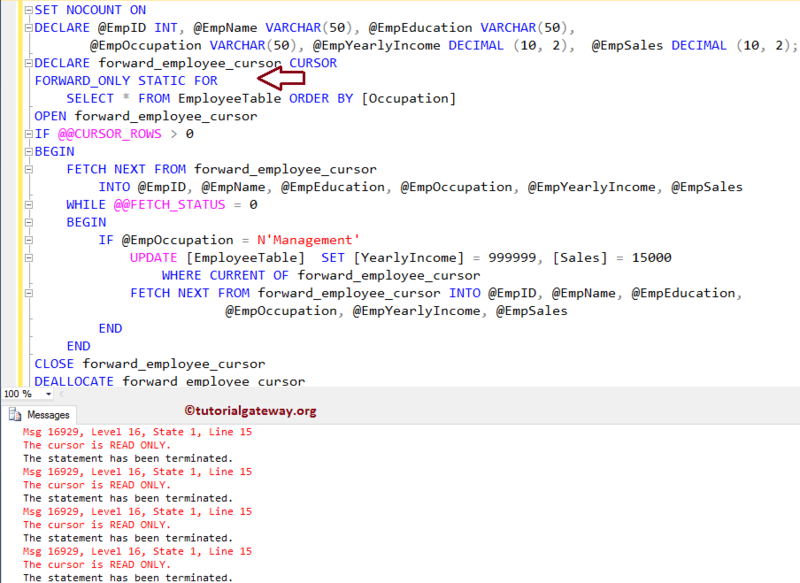 It means, SQL FORWARD_ONLY Cursors support FETCH_ONLY option, and it will an error for all the remaining FETCH options. 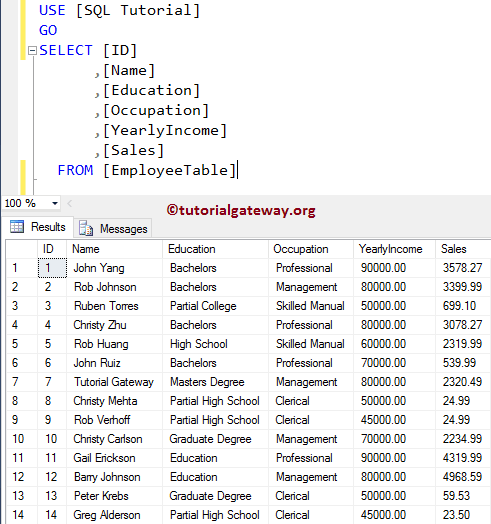 SQL Server allows us to use the STATIC, DYNAMIC, or KEYSET keywords along with the FORWARD_ONLY Cursor. And if you omit any of these keywords then SQL assumes it as DYNAMIC. 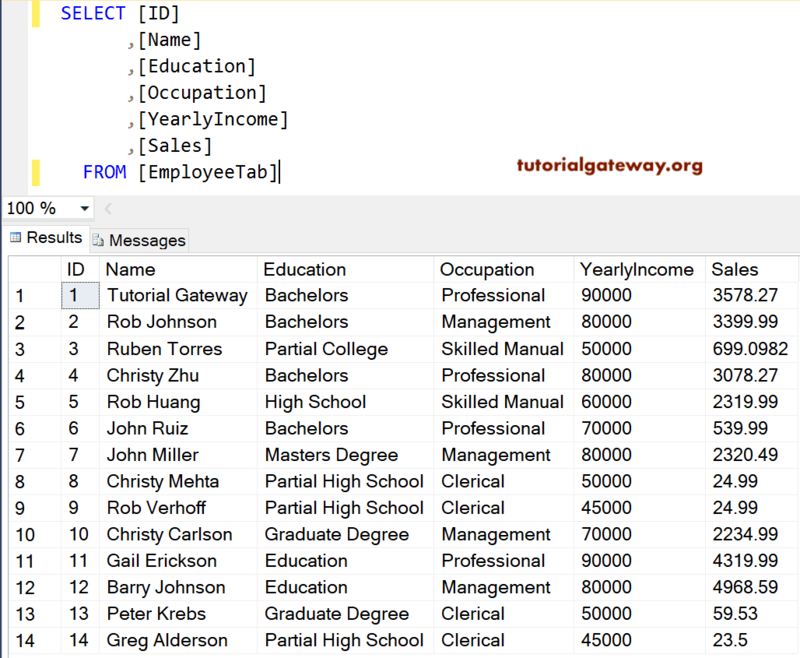 In this article, we will show you, How to Create a forward_only Cursor in SQL Server with an example. For this demonstration, We are going to use the below-shown table. 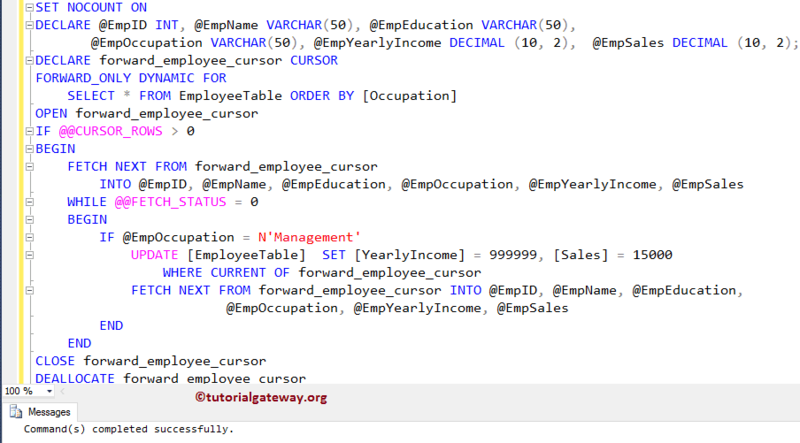 In this example, we will show you, How to declare, and open a forward_only cursor in SQL Server. And here, we will use the different FETCH option to demonstrate the supporting fetch options. Next statement will fetch, or return the next record from the forward_employee_cursor cursor. Though our employee table has 14 records, the cursor is retrieving 1 record. This is because, FETCH NEXT will fetch only one record from the cursor, and if you want all then use Loops. Let me use the FETCH FIRST option. As you can see, this is throwing an error. Let me use the FETCH LAST option. Next, we used the FETCH PRIOR option. If you observe the cursor declaration carefully, we are using FORWARD_ONLY STATIC cursor, and performing the UPDATE option. 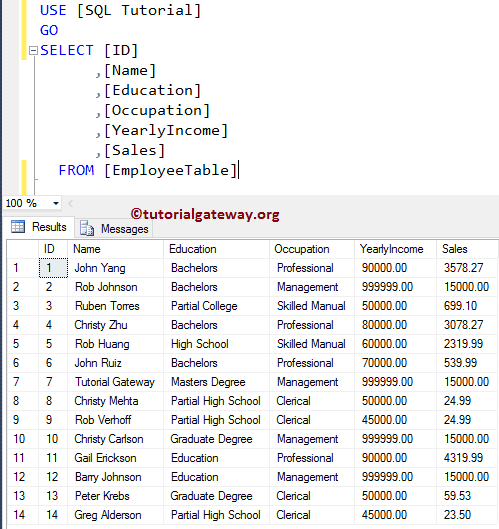 We already explained the remaining steps in our previous article, I suggest you refer Dynamic Cursor in SQL Server example. You can see that the error is stating: The Cursor is READ ONLY. This is because we mentioned the FORWARD_ONLY STATIC in the cursor declaration. And, STATIC Cursors does not support INSERT, DELETE, or UPDATE operations. Please use the following SQL Query to check whether the Cursor has updated any of the records in the Employee table or not. Now you can see the updated records.